On 12 January 2013, the US completed at least 23 strikes in Somalia, of which 9 drone strikes, killing between 58 to 170 persons, of which 11 to 57 civilians, including 3 children, and causing at least 44 injured. In absence of official announcements or reliable data disclosure, the information has been collected by investigative journalists in the field. Reality may therefore be considerably grimmer : for example, in six instances, although the attacks are corroborated, the number of casualties remains unknown. The US undeclared war in Somalia was kick-started in 2001 by president G. W. Bush and the defense secretary Rumsfeld. However, their will to launch military attacks against Somalian targets was frustrated by the lack of intelligence, the war remaining limited to the financial, intelligence and political arenas. On March 2003, US agents abducted the alleged al-Qaeda member Suleiman Abdallah from a hospital in Mogadishu and secretly "rendered" him to the network of secret prisons maintained across the planet by the CIA, where he was tortured and held in confinement for 5 years until being released in 2008. A string of other covert operations, increasingly sophisticated, including intelligence gathering, dealings with local corrupt warlords, infiltration of local organizations, ground operations by US mercenaries, further abductions and "renditions" took place from 2003 through 2006. The US engaged in a classic war by proxy on December 2006, the front-stage part being performed by the Ethiopian forces that invaded Somalia, while the US provided material and intelligence support, including airborne and drone support. The US soon became a major protagonist, by launching on January 2007 the first "Visit, Board, Search, and Seizure" (VBSS) operation against suspect boats near the Somali coast. This was followed a few days later by the first air strike after tracking by a Predator drone, killing up to a dozen alleged militants, of which 2 civilians, possibly children, and causing three injured. US air attacks supported by drone intelligence gained momentum thereafter. Elite troops from the Pentagon's Joint Special Operations Command (JSOC) have been routinely deployed on the ground for military operations. The CIA also operates a secret base at Mogadishu airport. In June 2011, the US began carrying out drone strikes in Somalia. The Pentagon confirmed recently for the first time that armed drones fly out of JSOC's Camp Lemonnier in Djibouti, "the busiest Predator drone base outside of Afghan war zone". Sixteen drones take-off or land every day, carrying out drone strikes. They can be over Somalia "in minutes". In August 2012 the US military told Congress they wanted to spend US$1.4 billion to increase the capacity to store munitions and arm aircraft. The developments will also increase the number of JSOC personnel from about 300 to 1,100. ¹ Correct at 12 January 2013. 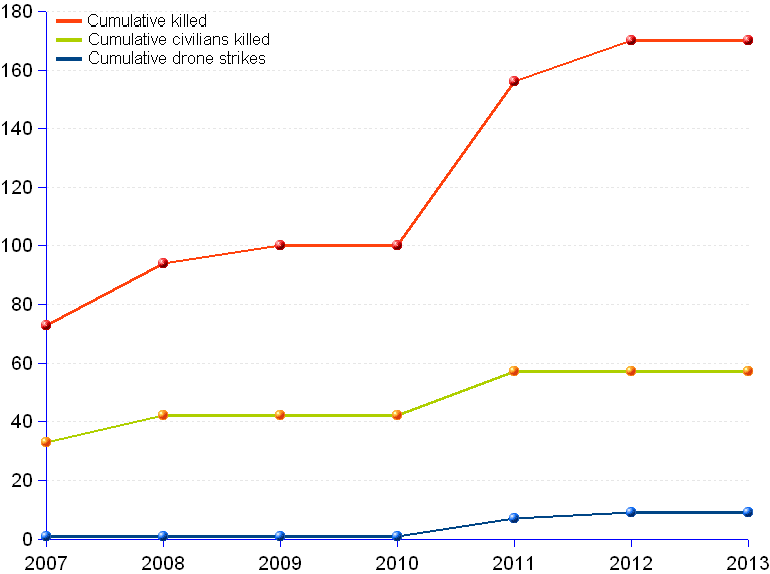 The line chart shows the trends followed by both the killings and the number of drone strikes in Somalia since 2007. 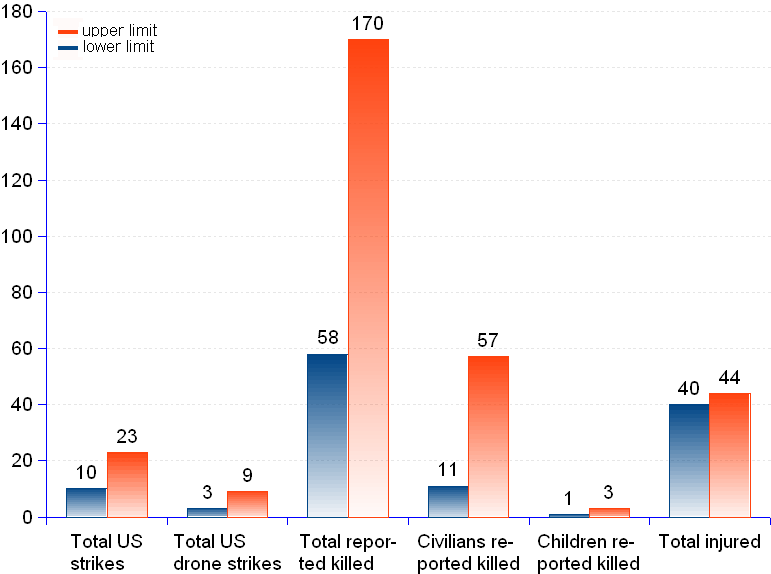 With 6 drone strikes in 2011, the total of killings, including a swelling number of civilians, grew by almost 60%. Without any post-operation formal investigation by independent entities, it is impossible to justify the killing of, not only the civilians who cannot be simply discarded as "collateral" victims, but also of the alleged combatants, who have not been individually and factually identified. The only possible inference is that killer drones are extremely lethal, more so when they fly in the overcast skies of illegality. Sources: The Bureau of Investigative Journalism.